Girls determined to be XY females (gonadal dysgenesis) often present with failure to begin menstration (amenorrhea). These young ladies have rudimentary ovaries that appear as linear “streaks.” Due to the risk of malignancy (most commonly gonadoblastoma), surgical removal is recommend. 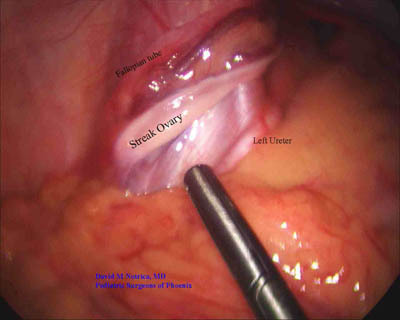 This is most easily done laparoscopically. XY females are unambiguously females. While their ovaries are non-functional, there is no question as to there female gender (which is independent of ovarian function). No internal male organs are formed. The gonads do not develop into ovaries or testes. These are sometime referred to as “indifferent gonads” because of their failure to differentiate. While the diagnosis often comes as a shock to the teenager and her family, it is important to remember that this knowledge does not change who they are, nor does it define them.